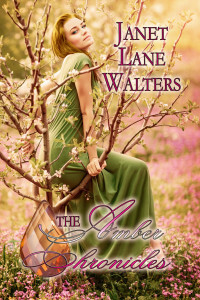 Amber Chronicles Collection: Emme, a witch and the heir to the throne of the world called Amber is banished from her home to find love. She believes she can command a man to love her but this does not work. Angry at being told no by the crown prince of Rivand she casts a spell on the Riva family. Every hundred years when the moon is full at the summer solstice she will call the crown prince. If he refuses to cede his love to her he will enter the amber orb and vanish. Four times she fails and the princes find adventure on other worlds. One turns an enchanted amber dragon into a princess. The second is imprisoned in an amber tower and must select a bride. The third must free the heroine from an amber cage. Emme slowly learns her lesson and returns to spend her childhood with the fourth prince. Hoping knowing each other will help. She has fallen in love with the crown prince and enters the amber orb in his place. Can Emme who is Cast in Amber be freed and gain the love she has sought for all those years?